Publisher: Geoffrey Nevine July 16, 2018 This information is provided solely as a guideline. 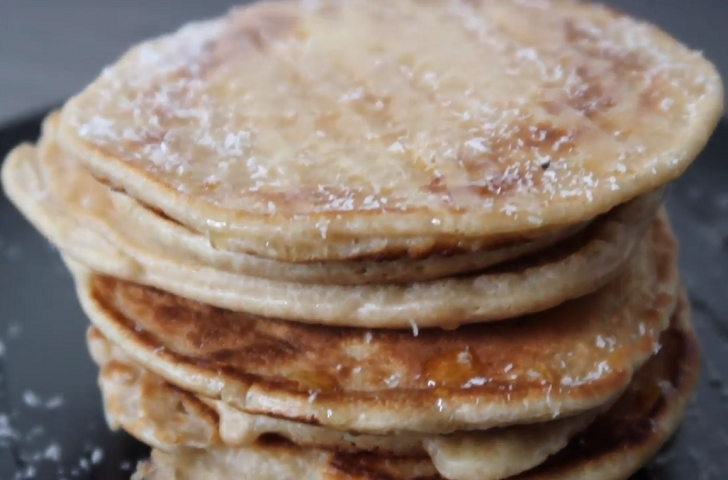 I tried this pancakes recipe twice- and they were a hit with my husband and kids. The first time they were a little heavier- because oat flour is typically a heavy flour and I used less coconut milk. So they would take longer to cook. Then the taste of coconut perhaps from using too much coconut oil was very strong. The second time I tried them they were a success! I thinned out the mixture and added rolled oats instead of using just oat flour and shredded coconut. They were light, fluffy and yummy! Enjoy the recipe! ⏩Mix the oat flour, rolled oats, shredded coconut, cinnamon, brown sugar and baking powder in a bowl and mix well. ⏩Add in the egg, vanilla and coconut oil and mix to form a thick mixture. ⏩Pour the coconut milk bit by bit and mix to your desired consistency. ⏩In a hot pan, put a little bit of the coconut oil and using a 1/4 cup measurement pour the mixture into the hot pan. If you have space you can do two pancakes at a time. ⏩Once the pancakes begin to bubble at the top, flip them over and cook the other side. But wait why go gluten-free? What is all the fuss about gluten anyway? Gluten can be found in wheat, rye, barley and some oats. I can totally relate to mood swings effects of gluten. Before I started my journey, I was addicted to sweet baked treats (typically laden with gluten). I would have in a day up to 10 digestives. And several slices of bread. Plus my either chapati for dinner or those cookie desserts after dinner. I was consuming a whole lot of gluten! My health was actually paying for it- my moods were very unstable. I was more irritable, sometimes depressed and anxious. On top of that, the bloating and slow digestion would make me very sluggish. Once I discovered that gluten was contributing to my mood swings and indigestion it just had to go! I always give this story how when I started my weight loss journey, I decided to just begin by quitting digestives. I was going, to begin with, small steps and that is what I could handle. Just the up to 10 digestives a day. And I weighed myself about a week later- and whoa! One kilo down. I could not believe how those empty calories were contributing to my weight gain and on top of that me staying unhealthy. Empty calories you do not need for sure! Should you go gluten-free? Yes if you have celiac disease- an autoimmune reaction provoked by gluten. Or if you have gut sensitivity because gluten has been known to cause inflammation in our gut causing something called ‘leaky gut’. Gluten has been known to spark Type 1 diabetes, autoimmune diseases, brain fog and several brain disorders and Fibromyalgia. By all means, do go gluten-free!